Are you looking to make the business case to expand your team? NAEM's EHS & Sustainability Staffing, Structure and Budgets report allows you to benchmark the design of your company's staffing and structure based on industry, revenue, head count and risk profile. It also provides detailed information on the scope of EHS & Sustainability responsibilities, including the areas where the EHS and Sustainability function is most often collaborative within companies today. 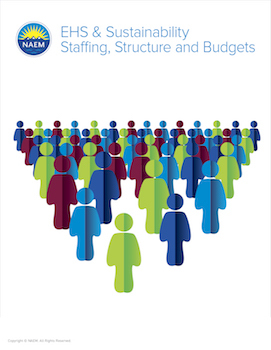 NAEM’s EHS & Sustainability Staffing, Structure and Budgets report is the only benchmarking report available that was designed by a committee of peer leaders to help those who are at the helm, benchmark their organizations by industry, annual revenue, total headcount and level of operational risk. It is published once every four years. The next report comes out in 2020.